With the standardization of C++17, which happened officially in December 2017, we, as C++ developers, got many features to write better code. This book describes all significant changes in the language and the Standard Library. What's more, it provides a lot of practical examples so you can quickly apply the knowledge to your projects. The book has its roots in the long series of articles published at my site: bfilipek.com. I started discovering C++17 a few months before it was officially published and I got more and more curious over the time. The content on the blog was growing, and I decided to make a single package of those articles. Making the book was not so easy, though! The initial compilation was quite weak, and I knew that to provide a valuable package for my readers I need to do more work. I rewrote each chapter of this book and reorganised them, so they contain the most relevant content. I’ve added tons of new code samples, with a better description and use cases. I believe this book might give you a solid start into C++17. The book contains now over 280 pages. I plan to rewrite a few more chapters and add some new pieces: especially with larger examples. The final version should have around 300 pages. Bartłomiej Filipek is a C++ software developer with more than 11 years of professional experience. Bartek finished Jagiellonian University in Cracow with a Masters Degree in Computer Science. He has experience with desktop graphics applications, game development, large-scale systems for aviation, writing graphics drivers and even biofeedback. Since 2011 Bartek has been regularly blogging at his personal website: bfilipek.com. In the early days the topic revolved around graphics programming, and now he focuses on Core C++. 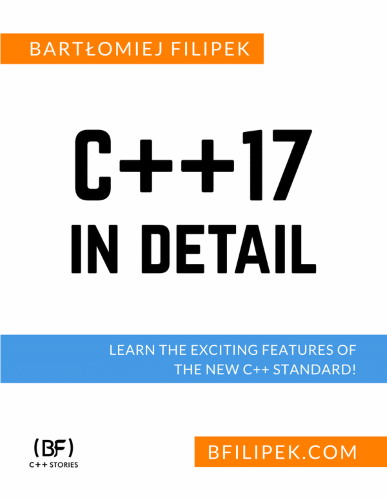 C++17 in Detail is the ideal guide for C++ programmers who want to leverage on C++17 to write better code. The book shows the new features of the language under a practical angle, with copious details and code examples while still being accessible and easy to read. Bartlomiej Filipek's work is my go-to reference for C++17 features, and C++17 in Detail captures it all in one book. C++17 in Detail is a whirlwind tour of the new and exciting features of the new C++17 ISO standard. Incubated from Bartek's excellent series of articles, his book properly organizes the topics and really goes into details when needed. Whether you're coming to modern C++ just now or you are a seasoned C++ developer and want to learn all the nitty-gritty of the new standard features, you'll find in this book amazing examples (minimalistic, yet practical) and explanations to help you along the way. Sample content. 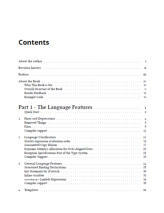 Includes three chapters: "General Language Features", "Attributes" and "String Conversions"